Ado Ekiti—The All Progressives Congress, APC in Ekiti State has berated Governor Ayodele Fayose for failing to rescue Gossy Water from liquidation. Gossy Water is one of the few surviving business enterprises of Ekiti State. In a statement by its Publicity Secretary, Mr. Taiwo Olatunbosun, APC also blamed the governor for creating unfriendly atmosphere for businesses, regretting that instead of building on the initiatives of his predecessors to sustain job-creating businesses, the governor created conditions that hampered business operations with attendant job losses, allegedly preferring to spend money on projects awarded to his friends for personal gains. The board of Warm Spring Waters Ltd had given liquidation notice to stakeholders, citing the failure to pay its debts and other challenges. Olatunbosun said it is disheartening that instead of attracting investments to the state like his predecessors, Fayose had through his alleged recklessness to the initiatives of his predecessors for investments, been driving investors away from Ekiti while existing businesses are winding up. “It is on record that the Fayemi administration provided electricity in many communities through rural electrification, distribution and repair of transformers while liaising with the power company to restore electricity in many towns. “Ikogosi Warm Spring Company would not have been without electricity under such an administration as it is under the Fayose administration now, resulting in huge debts overhang, which has led to its liquidation. 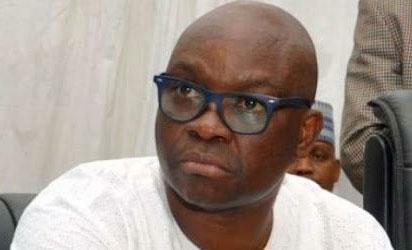 The post Don’t liquidate Gossy Water, APC warns Fayose appeared first on Vanguard News.